Netflix is one of my guilty pleasures in life. Guilty because I believe TV is evil and try to limit the amount of time I spend in front of one. Yet, there are good, interesting, and entertaining shows out there which I enjoy watching every now and then and Netflix is an economical way to get some of this content. A minor issue I have with Netflix, however, is I never know which titles are available. This is compounded by the fact I only have the “streaming” plan, which negates all the DVD/Blu-Ray selections. I often find myself wondering if a movie is available on Netflix, and if so, whether or not it is streamable. 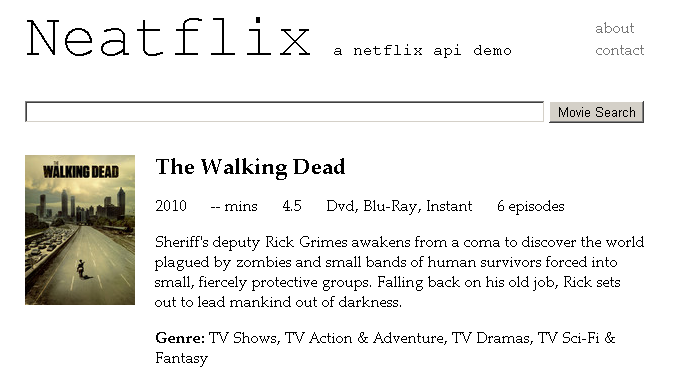 When I discovered Netflix had an API, I saw an opportunity to learn something new by creating a web app to solve this problem. Hence, Neatflix was born. That movie looks good! And it’s available on streaming. I guess I know what I’m doing tonight. Neatflix also shows the number of episodes in a TV series as well. Ever wondered how long Season 1 of “The Walking Dead” is? Only 6 episodes, pretty short season. I wonder if Game Of Thrones is available to stream..
Dvd and Blu-Ray only. Darn! 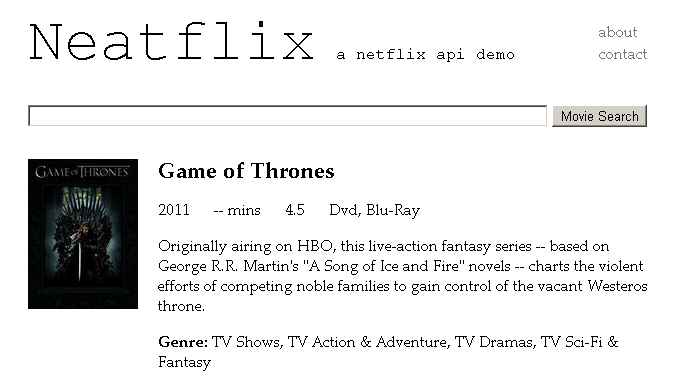 Neatflix is only a demo at this stage, but I hope to add more features in the future. It was fun learning how to make OAuth requests, hide sensitve developer key data, parse xml, and manage data flow in a web app. I plan to share some of my experiences in a future post. 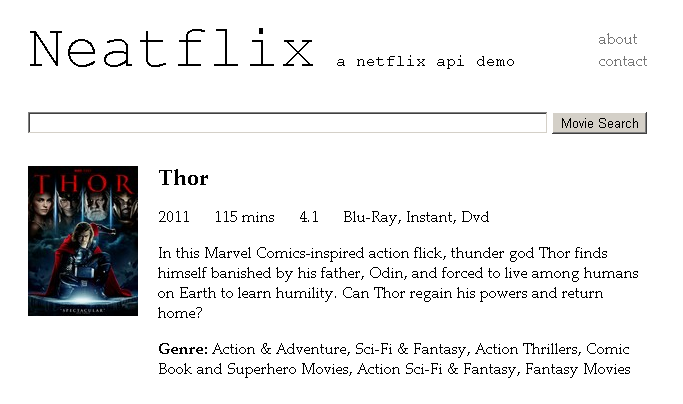 In the meantime, check out http://neatflix.appspot.com if you want some quick information on a particular Netflix title. The source code is also available publicly in my Github.